Aims: The aim of this study was to describe the trends in uptake of minimally invasive oesophagectomy in England over last 12 years (1996-2008). 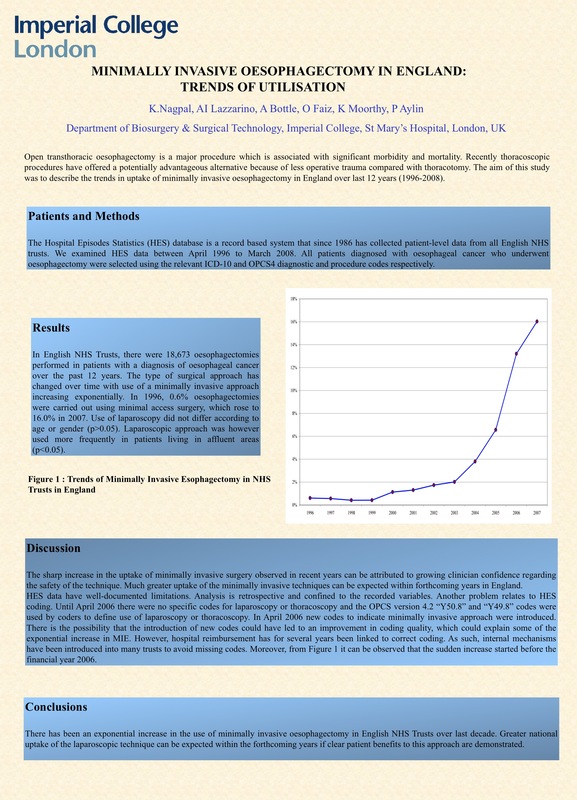 Methods: The Hospital Episodes Statistics (HES) database is a record based system that since 1986 has collected patient-level data from all English NHS trusts. We examined HES data between April 1996 to March 2008. All patients diagnosed with oesophageal cancer who underwent oesophagectomy were selected using the relevant ICD-10 and OPCS4 diagnostic and procedure codes respectively. Results: In English NHS Trusts, there were 18,673 oesophagectomies performed in patients with a diagnosis of oesophageal cancer over the past 12 years. The type of surgical approach has changed over time with use of a minimally invasive approach increasing exponentially. In 1996, 0.6% oesophagectomies were carried out using minimal access surgery, which rose to 16.0% in 2007. Use of laparoscopy did not differ according to age or gender (p>0.05). Laparoscopic approach was however used more frequently in patients living in affluent areas (p<0.05). Conclusions: There has been an exponential increase in the use of minimally invasive oesophagectomy in English NHS Trusts over last decade. Greater national uptake of the laparoscopic technique can be expected within the forthcoming years if clear patient benefits to this approach are demonstrated.